DARMSTADT, GERMANY--(Marketwire - Jan 31, 2012) - Biometrics is generally about machines identifying people. For this purpose, certain features of a person are used in order to identify him or her. The most well-known procedures are finger-print, iris and facial recognition. Especially in Europe, biometric applications are frequently the topic of controversial discussions. The "European Association for Biometrics" (EAB), newly founded on November 17, 2011, pursues the goal of driving the research and development of biometrics. The EAB is about promoting the appropriate and beneficial application of the technology. "Despite all positive forecasts, a global biometrics boom has not set in so far", says Alexander Nouak, Chairman of EAB and head of the "Identification and Biometrics" competence center at Fraunhofer IGD, the world's leading research institute for applied Visual Computing. Nouak deems it insufficient to put biometrics on a level with security. 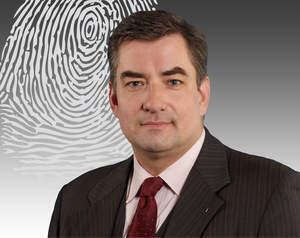 In his view, the prime task of biometrics is to increase the comfort of security systems. "Because I have my biometric features with me at all times, there is no need for me to remember any codes, passwords or PINs and to take along keys or cards", says Nouak. "Biometrics can simplify our lives if privacy remains protected and the application corresponds to the required security level." The non-profit EAB wants to bring together industry, regulators and user groups. For this purpose, it aims at founding a Europe-wide network, which will also discuss its experiences with representatives from politics and business. Moreover, the organization wants to be an independent contact point for interested parties and promote the training of biometrics experts. Joint training and research activities of EAB members are to be one focus of its work. The EAB will have its first appearance on the European stage at the European Biometrics Symposium in Brussels on February 17, 2012. The foundation of the EAB is a follow-up activity of the project "BEST Network" promoted by the European Commission within the scope of the 7th research framework program. This thematic network formed a European forum for representatives from business, politics and research on biometrics. The 26 BEST partners are also the founding members of the EAB and elected as members of their board: Michiel Kraak (UNHCR), Max Snijder (Biometric Experts Group), John Forrester (Ancitel), Christoph Busch (Gjøvik University College), Farzin Deravi (University of Kent), Peter Hanel (Federal Ministry of the Interior, Austria) as well as Alexander Nouak (Fraunhofer IGD) as chairman. The Fraunhofer IGD is the world's leading institute for applied research in Visual Computing. Visual Computing is image- and model-based information technology. It includes computer graphics, computer vision, as well as virtual and augmented reality. Fraunhofer IGD develops prototypes and complete solutions pursuant to customer-specific requirements. The researchers at Fraunhofer IGD use, record and process images and graphics for all conceivable computer-based applications. The research and development projects of Fraunhofer IGD directly relate to current business issues. The application spectrum of the concepts, models and practical solutions is as diverse as it is specialized. It ranges from virtual product design via medical science, transportation all the way to multi-media learning and training. Together with its partner universities, Fraunhofer IGD researches various key technologies and cooperates with companies in many different industry sectors. In addition to the head office in Darmstadt, Fraunhofer IGD has further sites in Rostock, Graz and Singapore. It has more than 200 (full-time equivalent) employees. The budget amounts over 16 million euros.